Kelly Ripa has a lot to say about her relationship with former co-star, Regis Philbin. Amid reports of a growing feud between the Live! co-hosts, Ripa finally revealed what it was like working with Philbin before he left the talk show in 2011. Will Ripa and Philbin ever make amends? According to Radar Online, Ripa revealed that Philbin refused to talk when the cameras were off. Ripa believes that Philbin was very superstitious about talking on set and constantly told her to save it all for the cameras. Ripa couldn’t even say good morning without Philbin stopping her. Ripa’s interview comes amid reports that the former colleagues are still feuding with each other, even though he left the show over five years ago. Rumors of a growing feud surfaced when Ripa avoided Philbin at a party this year. Ripa reportedly showed up early at the event and left before Philbin arrived. An insider claims that Ripa and Philbin have not spoken to each other since he left the show and that she refuses to return his calls. Philbin was a part of Live! for a whopping 24 seasons before departing in 2011. Michael Strahan replaced Philbin after he left, and Strahan was followed by Ripa’s current co-star, Ryan Seacrest. People reports that Philbin talked about leaving the daytime talk show shortly after his departure in 2011. 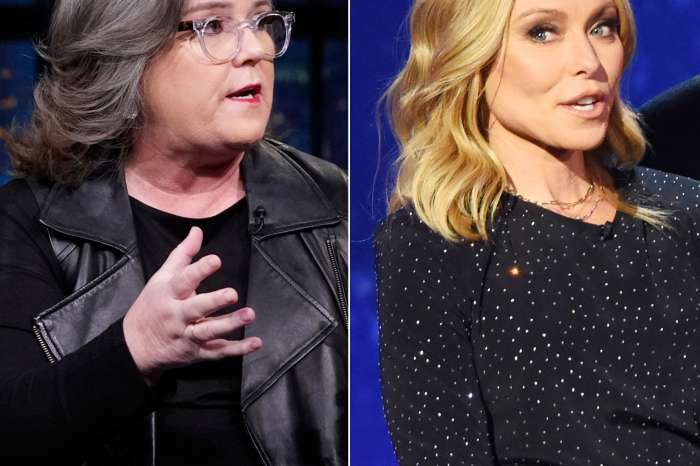 In a revealing interview, Philbin admitted that Kelly Ripa was offended when he quit and that she though he left the show because he did not like her. Philbin, however, revealed that he only left the series because of his advancing age and he thought it was time to move on with his life. Based on their ongoing feud, it sounds like Ripa still hasn’t gotten over Philbin’s departure. Ripa and Philbin co-hosted Live! for ten years before Philbin decided to retire. Ripa and Philbin may still be at odds, but her relationship with Seacrest is better than ever. According to Cinema Blend, Ripa absolutely adores her new co-star and recently declared him as the future of the network. It’s an @oprah thing! ??⭐️?? Unlike Philbin, Seacrest has no qualms about engaging in small talk before and after filming, which Ripa clearly enjoys. In fact, not only do they talk in between takes, but Ripa and Seacrest also spend weekends hanging out. Ripa’s relationship with Seacrest is similar to the one she shared with Strahan, though his shocking exit changed everything. Just like Philbin, Strahan departed Live! without letting Ripa know about his plans to move on. Ripa did not take Strahan’s exit well and even took a few days off from the show after Strahan announced that he was leaving for a spot on Good Morning America. Perhaps if Strahan and Philbin had kept Ripa in the loop, they wouldn’t have such a strained relationship with their former co-star. Either way, it’s good to see Kelly Ripa enjoying herself on Live! once again.